111 W. 57th St., New York. The story of how this album came about makes a fascinating read. The producers contacted Laurent Guenoun, custodian of Marcel Romano's archives. Romano had been the manager of Barney Wilen, the French saxophonist. They were in search of unreleased material. With Wilen they drew a blank, but their endeavours unearthed other treasures. Guenoun had a cache of tapes marked 'Thelonious Monk' which turned out to be the soundtrack and recording sessions for Roger Vadim’s 1960 film Les Liaisons Dangereuses, an adaptation of Pierre Choderlos de Laclos’ 18th century novel. Monk had recorded about 30 minutes of music for the film, never issued as a stand-alone album. Remarkably it had been set down in New York on a single day - July 27, 1959. 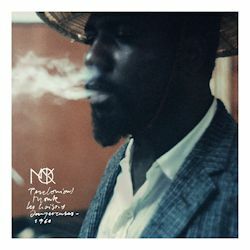 This first official release, courtesy of Sam Records, has the imprimatur of the Thelonious Monk Estate. This year marks the centenary of Monk's birth, and I can think of no better way to mark this significant milestone. Monk wrote nothing new for the film, but utilized music that already existed in his repertoire; he seemed disinterested in financial gain. Although an avid filmgoer, he had no previous experience of film scores. At the time he was approached, he was busy, in constant demand, overworked and beset by personal tragedies. Mental health issues, he suffered from bipolar disorder, had a bearing on the situation. After some prevarications, he saw the film and eventually signed a contract. He didn't make it to Paris, where the recording sessions were originally intended to take place, so the producers and engineers came to him in New York. These recorded gems capture Monk at the height of his powers. The Quintet consists of Monk on piano, Charlie Rouse and Barney Wilen on tenor sax, Sam Jones on double bass and Art Taylor on drums. "Rhythm-A-Ning" , "Well You Needn't" and " Six in One" are spirited and animated and one senses a real joy in the music-making. "Crepuscule with Nellie" (his wife) and " By and By" offer an element of contrast by softening the pace. The latter is a gospel hymn and seems a fitting end to the soundtrack. " Pannonica", named after Baroness Pannonica de Koenigswarter, a friend of Monk, exists in three versions, two for solo piano and one for quintet. Disc 2 offers alternate takes. "Pannonica" and " Light Blue" are 45 masters, but the most substantial offering is a 14 minute rehearsal sequence of the making of "Light Blue" containing plenty of dialogue. It makes for an absorbing listen. I'm astonished how well these recordings sound. The source material for the album, the master tapes in this case, have obviously been well-preserved. François Lê Xuân’s superb transfers and remasterings breathe new life into these nearly sixty year old recordings, and they emerge with the freshness and vitality as the day they were set down. Sam Records have gone to town on this release. The whole package is aesthetically appealing. The two CDs are housed in a sturdy, attractive tri-fold cardboard sleeve. Also included is a 56 page booklet featuring several interesting articles by various contributors, providing context and background to the making of these recordings. There are both black and white and colour photos of the New York sessions and a couple of still shots from the film itself. An outer card case supports both. It all constitutes a most desirable acquisition.